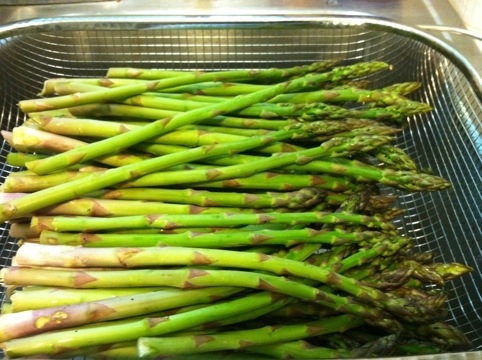 Fresh, local asparagus was the start of our pickled asparagus with mustard seed! I’m adding asparagus to my list of controversial subjects. So far, they include politics, religion, college basketball and cobbler. And now asparagus. If you’ve been reading along with us for a while, you know that Ellie and I took a canning class so we can continue to eat some of our favorite local foods all year. Actually, we now have a three-pronged approach to food preservation–canning, freezing and drying. We’re looking at what is available at the market each week and considering whether or not we enjoy it enough to try preserving it for the bleak winter months. It’s fun to seek out new recipes to try–dried fruit leather was a big hit. One of the recipes that piqued our interest is pickled asparagus with mustard seed. We love asparagus. We love pickles. So, what’s not to love about pickled asparagus? And our local grocery sells pickled asparagus for $7 a jar, so I’m all about trying the DIY version. I couldn’t decide whether this sounded really good or just really odd, so I posted an inquiry to my Facebook page asking the question: “Pickled asparagus. Good? Gross?” The overwhelming judgement was “gross.” Or at least “why?” as in “why would do that to a perfectly good asparagus?” A few people commented on texture issues with asparagus–would they be mushy? Ellie The Brave was all about it though, so we forged ahead. I picked up asparagus at the farmer’s market and apple cider vinegar at the grocery store and we got started. This recipe uses quite a bit of garlic, which made the kitchen smell great. I managed to get over my fear of canning garlic, which seems to be strongly connected to botulism if not done properly. The end result was some semi-attractive jars, although not as perfect looking as the grocery store variety. I was concerned about stuffing too much asparagus in the pint jars, but in hindsight, the hot water bath cooked them slightly and they shrunk up a bit, so next time I will pack the jars pretty full. How do they taste? Actually, very good! The asparagus are tender and not crisp like a true pickle, but also not mushy like asparagus from a can. The brine is good–tart, but with good seasoning from the mustard, garlic and pepper. They will be good with salad or even with deviled eggs. The garlic helps to balance the vinegar and give the pickles a nice savory flavor. If you like asparagus and want to keep it around past asparagus season, this might be something to try (you can also blanch them and freeze them). This recipe is from “Put ‘Em Up” by Sherri Brooks Vinton. Trim the asparagus to lengths 1 inch shorter than your pint jars and pack vertically into the clean, hot jars. Combine the vinegar, water, salt and sugar in a medium nonreactive saucepan. Bring the brine to a low boil, stirring to dissolve the salt and sugar, and then remove from the heat. Divide the garlic, celery seed, mustard seed, and peppercorns among the jars. Pour the hot brine over the asparagus to cover by 1/2 inch. Leave 1/2 inch of head space between the top of the liquid and the lid. Use the boiling water method. Release the trapped air from the jars. Wipe the rims clean; center lids on the jars and screw on jar bands. Process for 15 minutes. Turn off the heat, remove canner lid and let jars rest in the water for 5 minutes. Remove jars and set aside for 24 hours. Check seals, then store in a cool, dark place for up to 1 year.